Janesville, WI -- Glenn Joseph "Peter" Elmer passed away peacefully on January 29, 2019, in Janesville, WI. He was born on August 29, 1938, in Evanston, IL, the son of Glenn and Mary Virginia (nee Hanson) Elmer, moving as a toddler to Dubuque, IA, where he was raised. 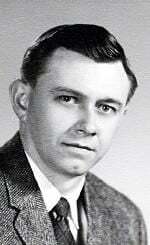 He attended Loras Academy of Dubuque, IA, and graduated from Loras College majoring in Business Administration in 1960, with additional study at Marquette University thereafter. He served as a Specialist E4 in the U.S. Army from 1961 - 1963. Peter married Karen Rauch at St. Anthony's Catholic Church in Dubuque, IA on November 22, 1969. Peter worked for General Motors in Janesville, WI, from 1960 to 2004, save his time in the Army, and wore many hats, including Internal Control Auditor. Peter read prolifically, and he was a gifted storyteller who greatly enjoyed relating his childhood exploits and those of his children. He loved dogs, and enjoyed travel and exploring. He channeled his passion for history into historical war gaming in miniature. Peter was a provider, caring from childhood for his widowed mother, and then for his wife and children, always letting them know that they were cared for and loved. He is survived by his loving wife, Karen; sons, G.J. Peter, Jr. (Luisella) and Robert (Melissa); daughter, Lori (David); and four grandchildren. He is predeceased by his parents; his stepfather, Edward Nicholson; and a sister, Judy Elmer, who died in infancy.